Everything The O.C. : The O.C. 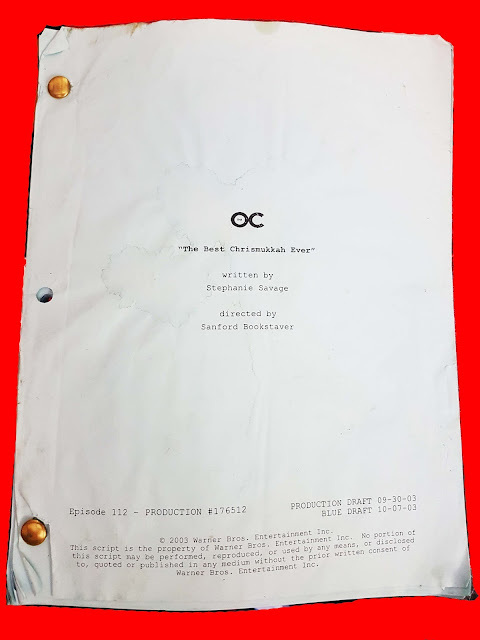 Memorabilia: The Best Chrismukkah Ever Script! The O.C. Memorabilia: The Best Chrismukkah Ever Script! At Everything The O.C. we love acquiring rare one-of-a-kind OC items. One of which is an actual script used in season 1 episode 13 "The Best Chrismukkah Ever". If you are unfamiliar with this episode your not a true fan! 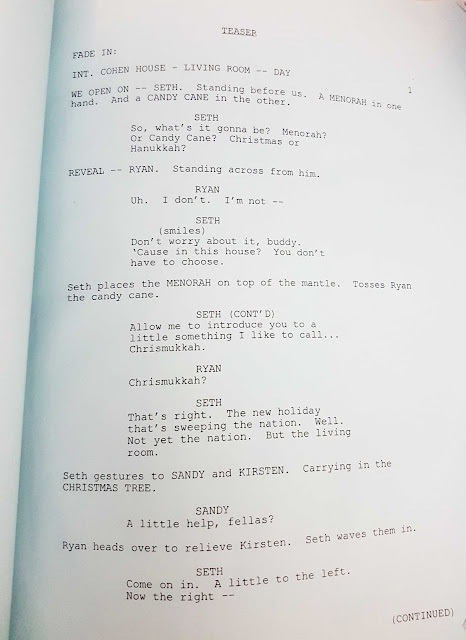 It's also known as the episode where Seth introduces not only to Ryan but to the whole world about his super holiday combining the best of Christmas and Hanukkah into one super holiday known as Chrismukkah. TV shows have multiple stages of scripts - this script above just so happens to be the blue draft from 10-07-03. This particular episodes is probably in the top 5 best episodes of the entire series. Notice at the bottom left they originally wrote this as episode 12 (112) - later turned to 13..Episode 12 was the Luke's dad Carson coming out episode called "The Secret". Here is a look inside. In this excerpt Seth is trying to teach Ryan about his super holiday! And here is the scene pointed out above. The look on Ryan's face is priceless. Let us know if you like these kinds of posts - if the demand is high enough we will be happy to scan certain scripts for the fans!